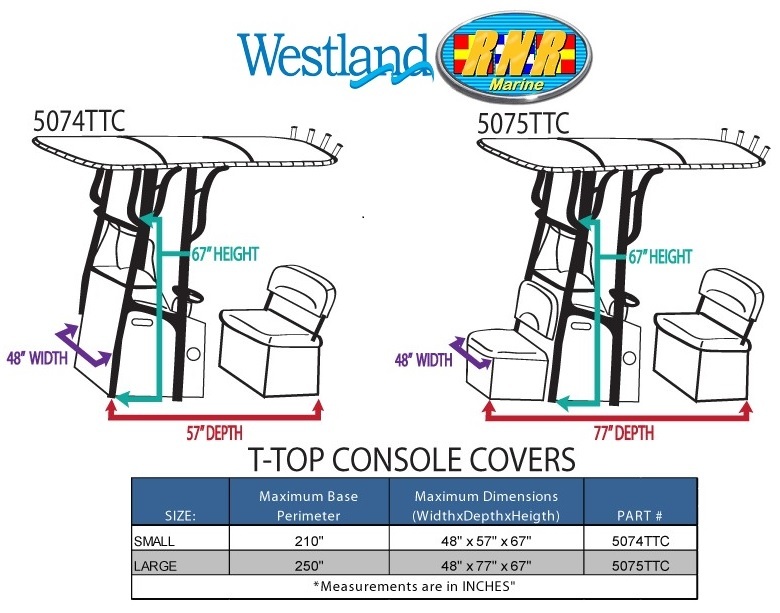 Notes: The Westland® T-Top Console Cover will protect the center console, steering wheel, helm and gauges below your T-Top from the sun's harmful and damaging UV rays, rain and bird poo. The cover is specifically designed to attach to the underside of your T-Top and will cover any console size with a base perimeter of up to 250 inches (approximately 21 feet). Adjustable straps allow you to tightly secure the top around your console for the best fit possible. 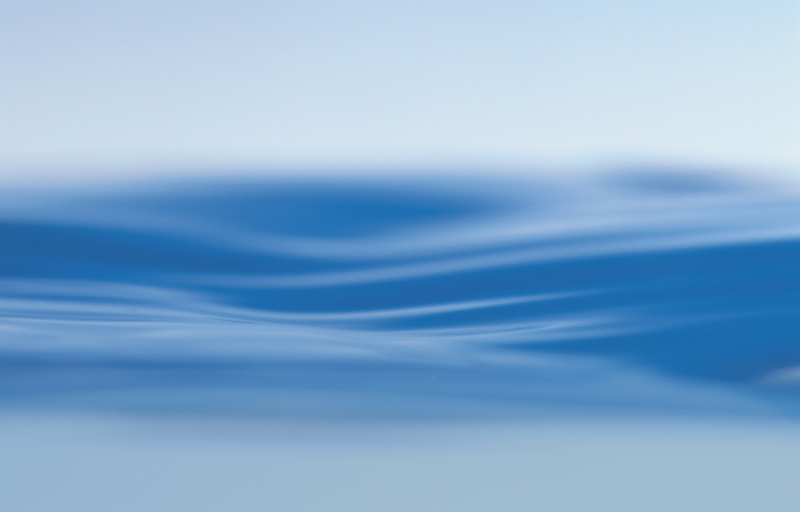 The cover is made of Sunbrella® fabric (the most durable, color-fast and long lasting marine fabric available) which breathes to resist mold and mildew inside the cover, unlike polyester or vinyl covers which hold moisture in. 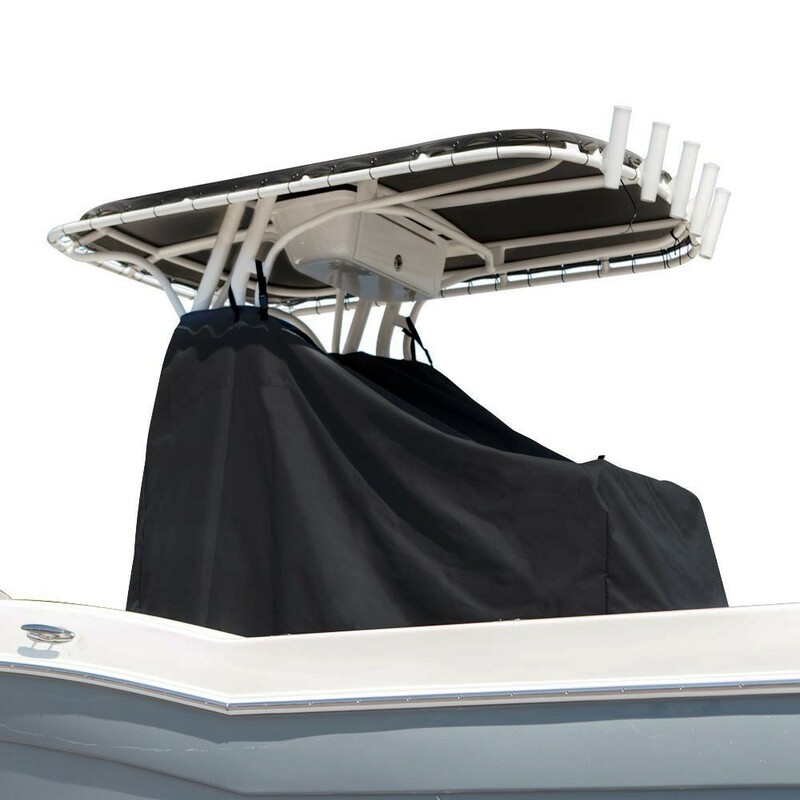 Made-to-order in the USA and shipped from Westland® Covers, Inc.
or Carver® OVER T-Top Cover to cover the T-Top, entire boat and motor. POSITION YOUR COVER: Position the cover so the ZIPPER will be on the STARBOARD side of the console. At the top of the zipper will be a 24 inch strap with a buckle. 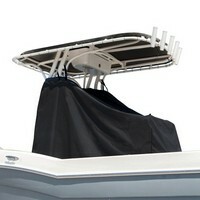 Use this strap to go up over the T-Top frame on your boat. Then zip the Zipper up. The PORT side of the cover also has a 24 inch strap to be used on that side. ADJUST THE LENGTH OF YOUR COVER: Once the cover has been attached and zipped around the console and helm seat, adjust both of the 24 inch straps until the cover just reaches the floor of the boat. TIGHTEN THE BACK STRAPS: The cover has (3) 48 inch straps that cross the back panel of the cover behind and on top of the helm seat. These need to be adjusted to allow some of the slack to be pulled behind the helm seat. Start with the lowest one and tighten to impprovie fit. SECURE THE WEATHER FLAP: Now that the straps are in place, you can secure the weather flap that is sewn to the front panel OVER the windshield bar and across the top of the console. This panel will fasten to the buckles attached to the outside of the cover over the helm seat. Adjust these straps to allow this flap to cover the opening over the console.